An unexpected trend has emerged due in large part to the economy. Adult children are asking to move back in with their aging parents, and the parents are saying “yes.” Most baby boomers do not have adequate savings, so the financial burdens of taking care of their adult children is taking its toll on their retirement savings. In a recent study by TD Ameritrade, 57% of parents are willing to support their adult children even if it means taking away from their retirement savings, and 54% have had their adult children living with them for 3 months or longer. Financial planners approach the subject of support for children in different ways. One approach is to have the parents document exactly how much money they are spending on their kids. Our approach is to really look at what saving will be needed to meet retirement spending goals, and then see how much is left over. This is a difficult situation no parent wants to be in. This is a time where having a financial planner in your life is truly valuable. The financial planner can help take the emotion out of the equation, and focus on what the real effect the spending on your kids is having on your own financial life. Plus, when it comes time to tell your kids you need to back off your spending on them, you can just blame the planner! For more on this topic, Lisa Shidler wrote a great article you can read here. 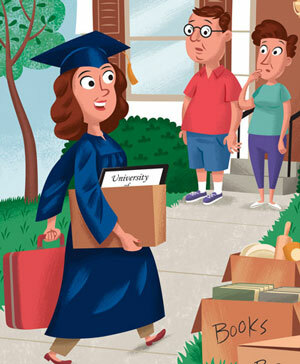 One Response to Empty nest? Think again! The reason most parents allow their adult children to move back home and/or consume their resources is due to guilt, shame and codependency. For many, even if they have a good reason to limit the help for their children, they continue to give up their resources due to these unresolved feelings and emotions. I have found looking at and working through these feelings via financial therapy has proven the most benefical approach I have come accross in dealing with this issue so far.